“What is my future”? “Do minorities have any? ShekinahToday 24th September, 2013: Religious minorities in Pakistan have long suffered to get the freedom they have always yearned for since the creation of Pakistan in 1947. The country’s flag bears two colours green and white. The green colour represents Islam and white portion of flag represents minorities in the pure land. I believe the white colour should rather be changed into red colour, given the bloodshed and killings minorities have suffered on the name of religion. The white portion of the flag is the misleading and wrong version of the way minorities have/are being treated in Pakistan. Unfortunately minorities are “unseen citizens of Pakistan”. The very existence of minorities is denied from the public to the private levels. They are often subject to neglect and discrimination in school and communities they live in. The only mention of minorities is witnessed when a colossal tragedy happens, when they are either killed, attacked, bombed or subject to discrimination, violation and prejudice. They live as non-entities, with no rights and freedom. From the access to public life to the denial of Government’s jobs, from the safety of religious places to the wide-spread societal taboos which play havoc with lives of millions of members of minorities unveil the unspeakable trauma of these dis-advantaged and down-trodden citizens of the country. Every time an excuse is engineered to attack, bomb and kill the most vulnerable and oppressed fabric of the society. Sometimes under the pretext of supremacy of religion or politics and on other a trivial personal grudge become a vehicle to target them. The recent attack on All Saints Church in Peshawar is yet another example of Pakistan’s inability and long history of treating minorities in Pakistan. Every time a tragedy happens, countless condemnations from all walks of life flood in, the next day everything is white-washed in the empty promises to make security a priority. The vicious cycle goes on and on. The history is littered with attacks on minorities in Pakistan. From the forcible conversions of Hindu girls in Sindh Province to the hatred spewed against minorities fan the flame of extremism in the country. Minorities are always scapegoated for whoever they are and whatever they stand for. It was rather sad to learn about the most recent tragedy of targeting people while they are in the most sacred places according to their belief. Be that in Churches, temples, or mosques. The safety of these minorities is a task the Government is yet to achieve. The death toll for the Peshawar Church attack rose to 85 while there are more than 130 injured. Most of the families in the local community have lost more than one family member. Uncles, aunts, friends, fiancées all gone while being at the “most scared and safest place in the world” – their religious place. 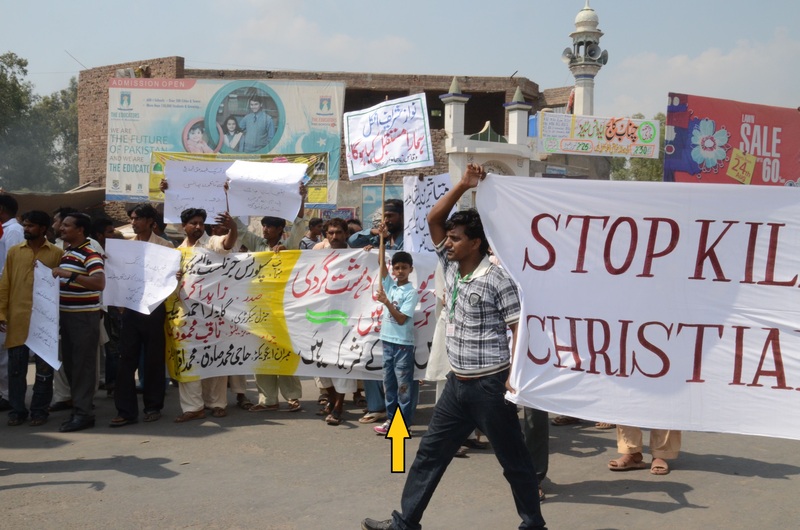 Since the Church attack on Sunday the angry Christians staged protest demonstrations all across the country against the atrocious killings of their brothers and sisters. While rubbing salt on their fresh wounds, it is reported that police has intimidated, harassed and even beaten some young Christians who chanted slogans against the brutal attack on the church. Christian minorities like others have suffered a lot in the recent past – from tragedies of Gojra and Korian where seven Christians were burnt to death on the accusation of desecrating pages of Quran to the extra-judicial killings of many Christians in Pakistan on the name of blasphemy. The recent escalations about the misuse of Pakistan blasphemy laws are the chilling reminder of how unsafe minorities are Pakistan. The first Pakistani women to have received a death sentence, Aasia Bibi is still languishing behind the prison and pending an appeal from Lahore High Court. There are security concerns in midst of a price over her head. Uncle Nawaz Sharif (Prime Minister of Pakistan) “What is my future”? I paused and thought for a minute. What future? This entry was posted in Articles, Pakistan, Persecution, Social Articles and tagged articles, Christian, christian news, Christian persecution, minorities, minority, Pakistan, Persecution. Bookmark the permalink.